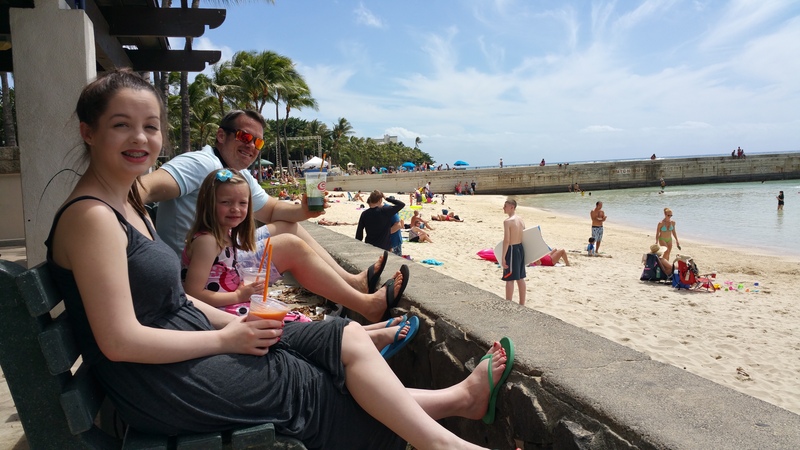 Hawaii With Kids- Oahu Family Fun Day 1 – It's a Lovely Life! Saturday morning we set off on another adventure to Hawaii! 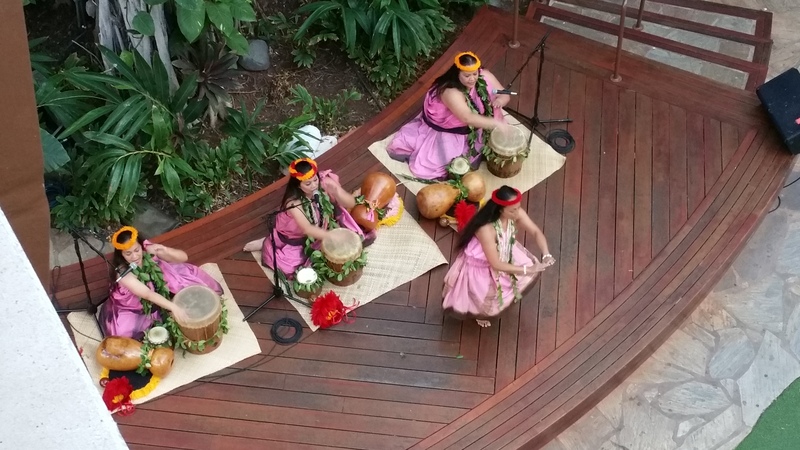 Visiting Hawaii has been on our radar for years. Pete and I said that we would spend our 15 year anniversary there, which didn't end up happening because we were invited to Turks & Caicos instead (which we were thrilled about), but we still wanted to visit Hawaii! 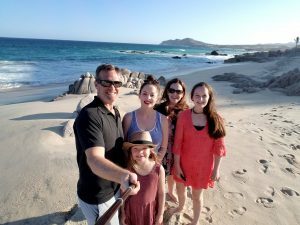 Growing up in Southern California I had already been twice before, but Pete never had….nor had the girls. When I sat down to map out our travel list for 2016, I put Hawaii at the top of the list and I am so glad I did. We've been here less than 48 hours and we already are planning a trip back. It's that amazing! With non-stop flights from many different areas, it is really easy to travel to. 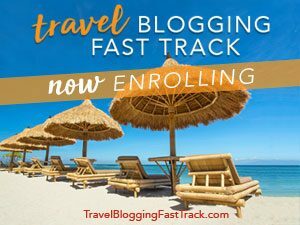 Our go-to airport is San Diego, and since we were visiting Hawaii, I started researching airlines with non-stop flights from SAN to Honolulu. I immediately thought of Hawaiian Airlines, and I reached out to them to see if we could feature them during our trip. 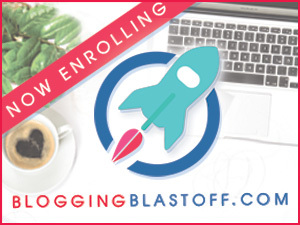 We are so happy to be partnering with them to share all about our experience flying to Hawaii. 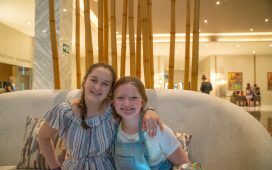 I have a whole separate post all about our flight… until then here is a little bit about our travel experience getting to the island. 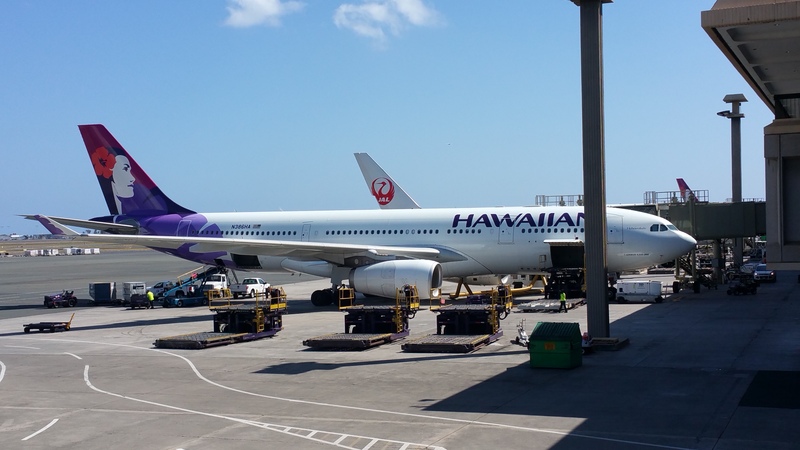 The minute you get to the airport, your vacation begins when you fly Hawaiian Airlines. See that lady above. She was everything Aloha! It was like your everyday life just melts away, and that was just the beginning. This is the friendliest airline we've ever flown on. 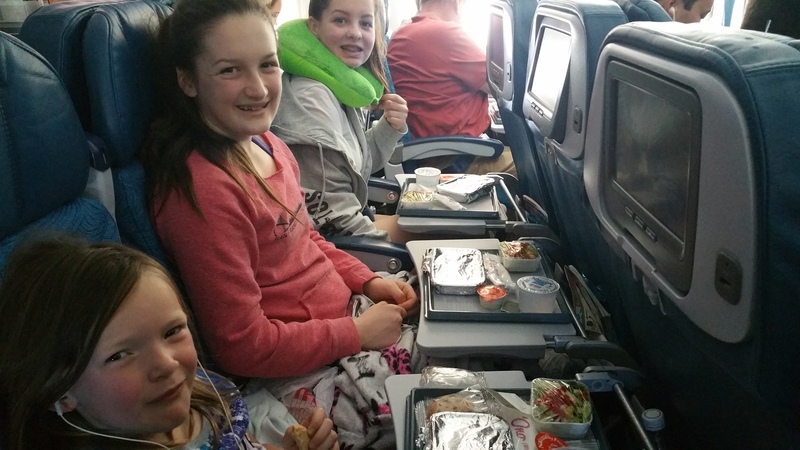 They also serve a meal, even in economy class. And the meal was vegetarian! That's not always the case, but we were thrilled that it was on this flight. They also offer a complimentary glass of wine to those over 21 in economy too. Instead of a “rushed flying for 6 hours” feel, we had a relaxed “we are on our way to Hawaii” feel the entire time. Our flight left at 10:30 am and we landed around 2:30 pm Hawaii time at Honolulu International Airport. The airport is well laid out and there is signage everywhere, but if you feel a little lost, there are friendly airport staff everywhere to help you. We decided to rent a car on this trip because we plan to see as much of the island as possible. We took a shuttle to our rental car facility to get our car. There was a bit of a wait since a few planes landed at the same time, but the weather was so perfect that we didn't mind. 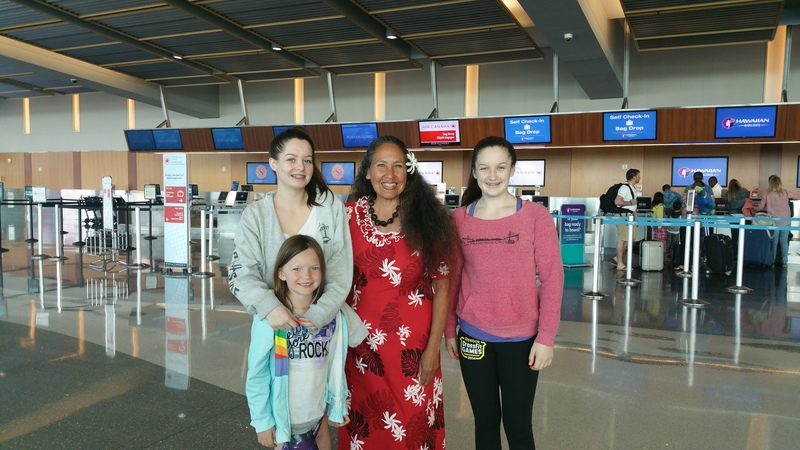 Plus the adrenaline was going, we were so excited to be on Hawaiian soil! Just about 20 minutes after we loaded into our car, we pulled into our hotel for the next two nights. 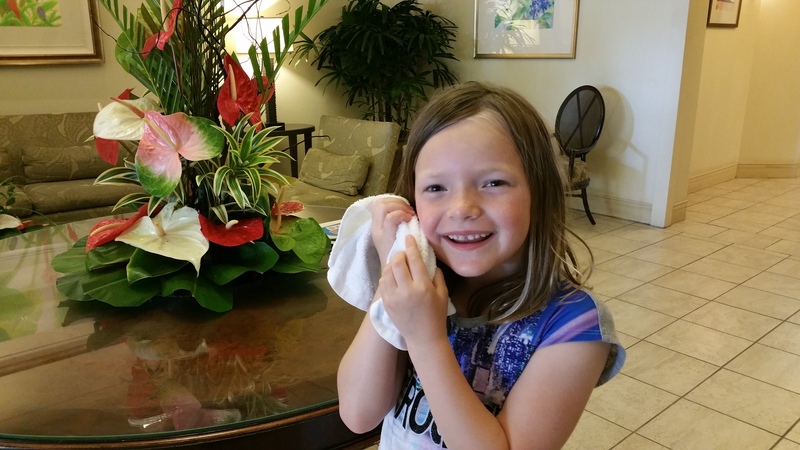 Starting with the cold welcome towel, with hints of almond scent… Emmy and I were in love this the welcome ritual. In the Caribbean, you are greeted with a rum punch (which is awesome) and an almond-scented ice cold towel is just as welcoming. We had to pry it from her arms before we headed up to see our suite! 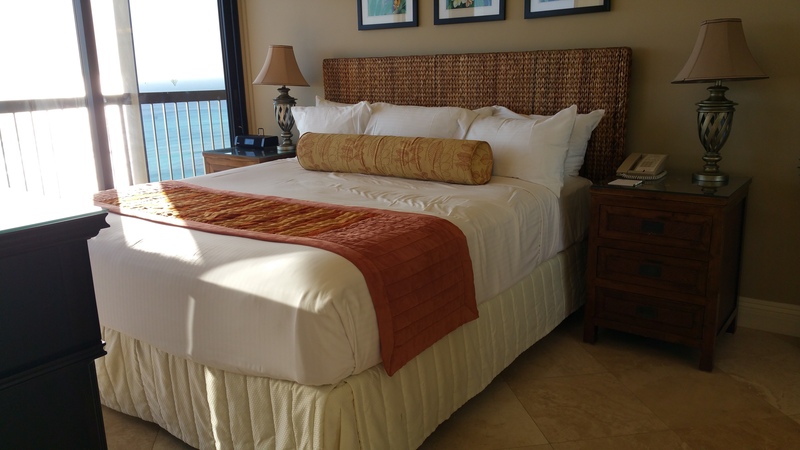 And then the suites… I can't wait to share all the pictures, but look at this bed! The girls had their own room and Pete and I had a master suite with truly forever views! It also had a full kitchen, washer and dryer, and two bathrooms. The location is amazing! As I type this, Pete and the girls are all down in the lagoon less than 100 steps from the hotel. Emmy said that when she is older she is going to live here all the time and we can visit her. I don't doubt that she will do it either. 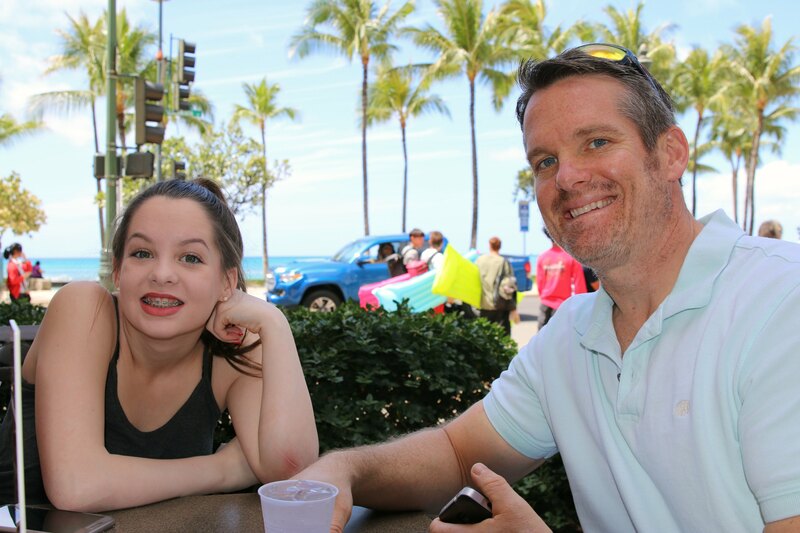 After we settled in and got refreshed, we went for a walk through Waikiki. It has changed so much since I was last here that I barely recognize it. I felt like I too was visiting for the first time! There is entertainment around every corner! 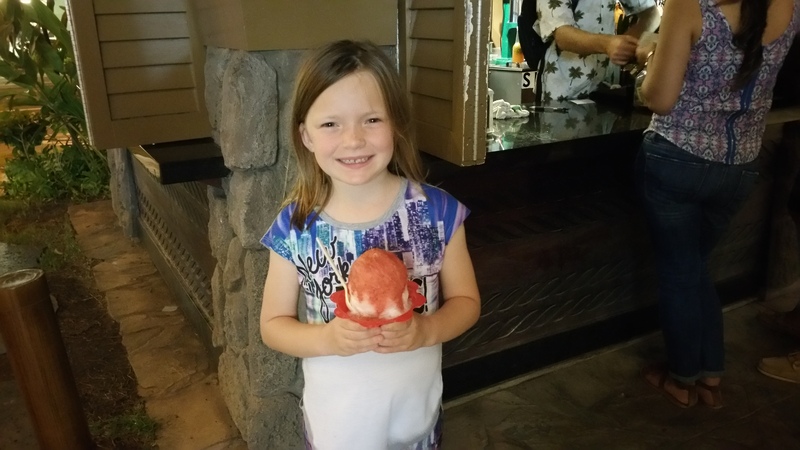 The one thing Emmy was waiting for the most was to try real Hawaiian Shaved Ice. We checked that off our list right away! Back in our room, we spent time just relaxing and taking the views in. 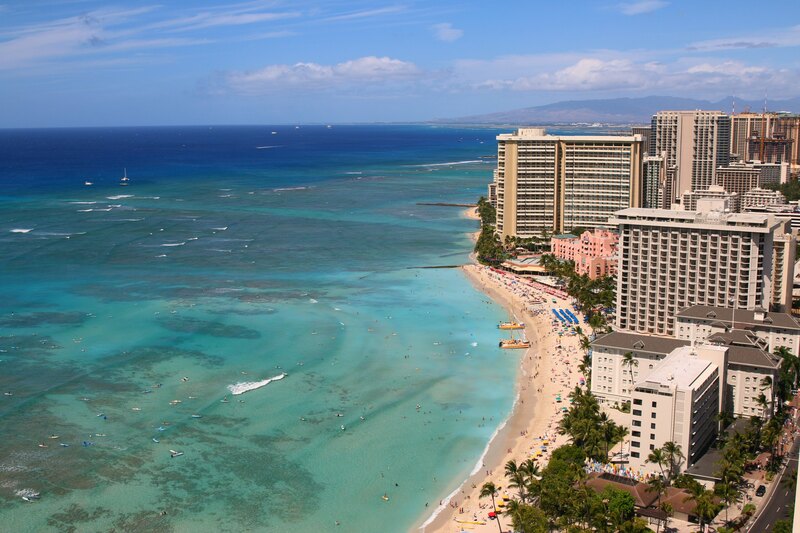 We could see all the way down Waikiki Beach and up to Diamond Head. I don't think it's possible to have a better view. 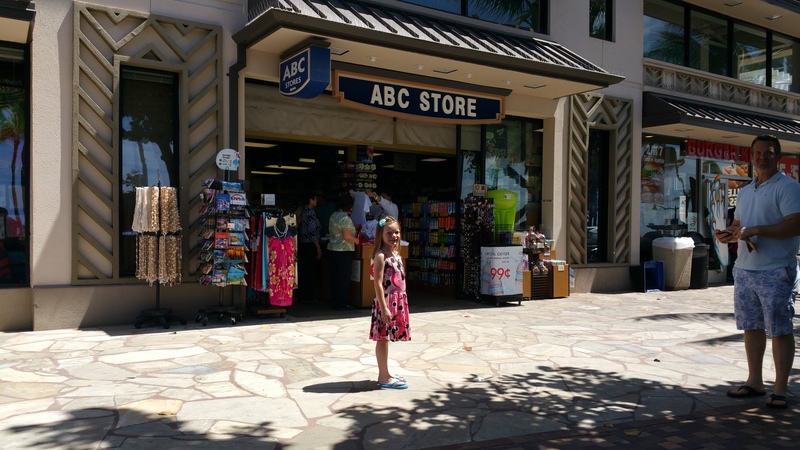 One thing I remember so well from my previous visits are ABC stores. They have them now in Las Vegas, but it's not the same. We took Emmy in to buy a flower clip for her hair and then she hula danced the rest of the day. Seriously! And before we knew it, it was dinner time. We had heard buzz around that today was a big day, we just didn't know how big until we saw the streets filling up. 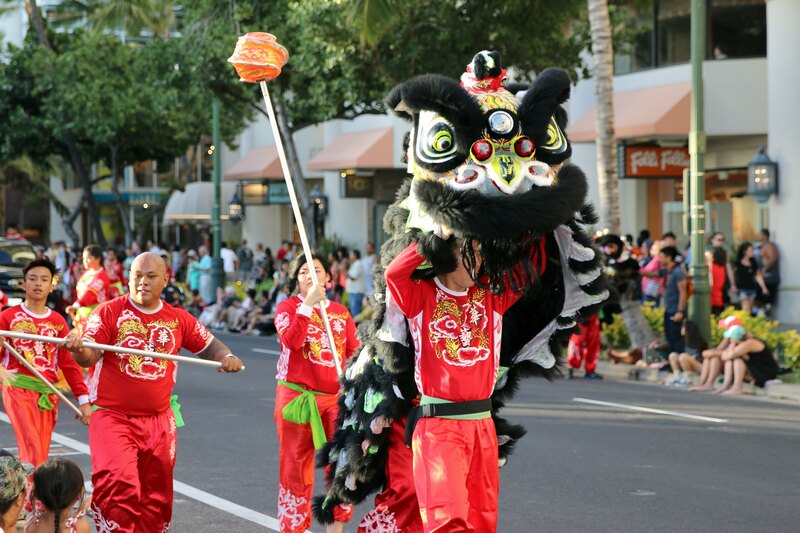 We happened to be visiting during Honolulu Festival time. This happens once a year during March. It is truly a cultural extravaganza! With a parade and then firework at night! 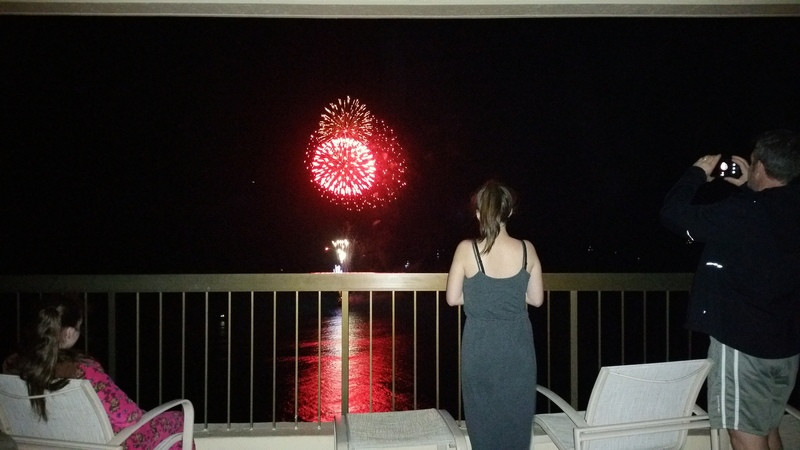 As luck would have it, the fireworks are shot off from boats directly in front of our hotel. 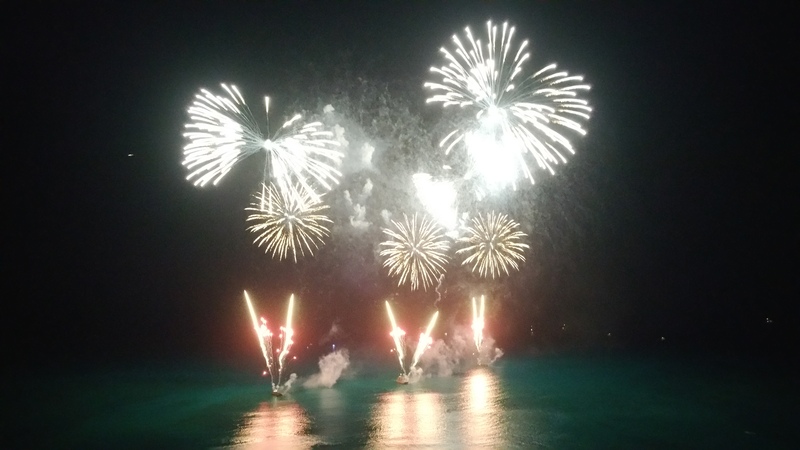 I have never seen a fireworks show like this ever before! 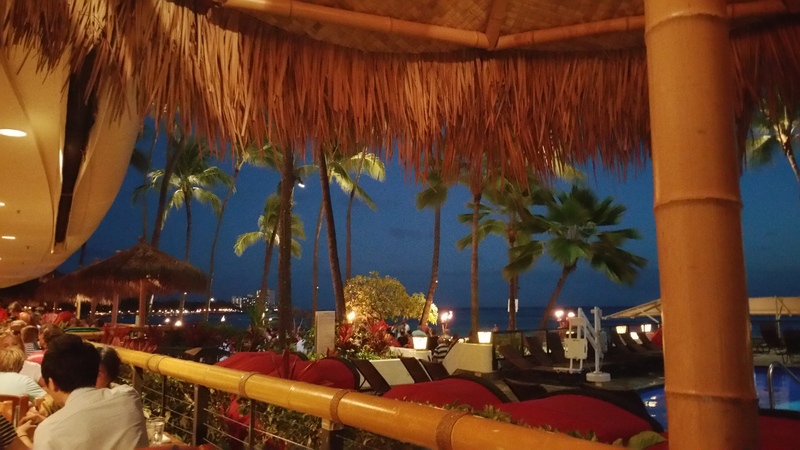 Dinner was hosted by Duke's Waikiki and it was fabulous. 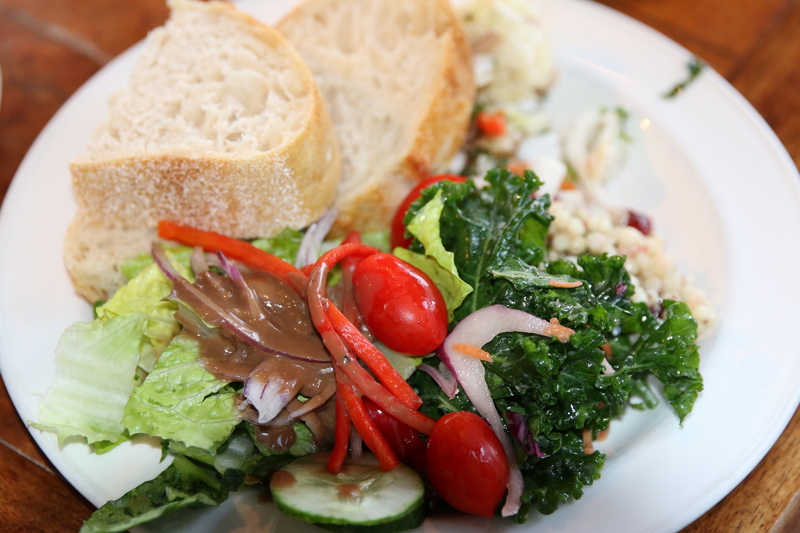 I'll be sharing all about it in another post, especially their new vegetarian and vegan menu launching today! It was a remarkable evening and the ambiance was totally “Hawaiian getaway”. We loved it! We got back to our room just in time for the night to be lit up with bursts of bright colors. Poor Emmy slept through the whole thing, but the rest of us were in awe! It felt like life just stopped for a few minutes and really it did! The whole area went silent as the fireworks were propelled into the air… and then all of a sudden thousands of people all started clapping and cheering together. Here is a video recap of day 1! 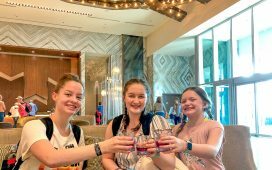 I couldn't imagine a better start to our Hawaiian adventure! Check back tomorrow for day 2! Have you been to Hawaii? What was your favorite memory you made? That looks stunning and fun from top to bottom. The food, the views, the green and the blue. No wonder Oahu has such a reputation for being the perfect tourist location. This looks like such a wonderful family time together for sure! Warm and inviting! Everything looks so wonderful and top of the line. I’ve never been to Hawaii, but maybe something that might happen. You sure know how to inspire one on vacationing there. So lucky! I’ve never been there! I heard it was an expensive place to visit, is this true! It looks like you guys had a lot of fun! I think it can be both, expensive and affordable, just depends on the time of year you go! awww! 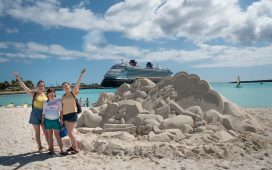 Looks like you are having a fabulous family getaway. Thanks for sharing. My husband and I are have been there twice and absolutely love it. I am very impressed you got the kiddies out there! The kids look like they REALLY enjoyed their time! 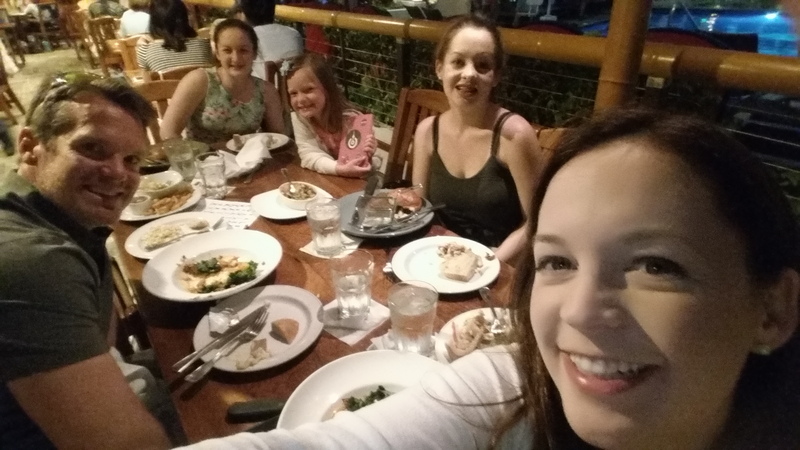 I love how you shared each part of your day with us – made me feel like I was there, too! Hawaii is on my travel bucket list! All of this looks so fun and the environment is beautiful! Wow does Hawaii look stunning! I love how gorgeous the landscape, and buildings are! We would love to visit too! My kids are a bit young to make such a long journey. I cannot wait for them to be a bit older so we can take the trip to Hawaii! I’d love to visit Hawaii one day. Probably without kids though. My son says he doesn’t want to go because of the volcanoes LOL. This looks like an amazing place to visit. I have always wanted to visit Hawaii. I can’t wait to hear more. Hawaii is on my bucket list. Looks like you guys had a great time! Day 1 looks fabulous! 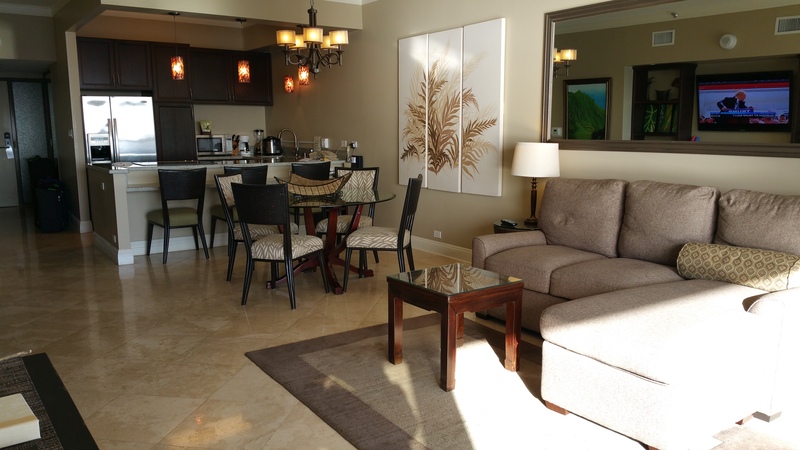 I love that the hotel you stayed at was like a mini apartment – that would be perfect for my family. Oh, and I know my boys would go straight for the Hawaiian shaved ice! Looks like the best time! I’ve never been to Hawaii. Going back to hawaii is on our bucket list for next year! Its such a beautiful place! 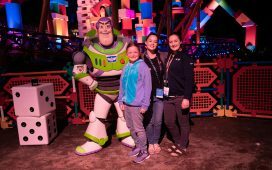 Oh what a wonderful adventure you and your family had!! I love love love the photos! I will always remember going there. I want so much to go again. I think I remember the heli-tour most of all! Wow. just a lovely place. Hawaii is on my bucket list! We all want to go, maybe next year! Love your pictures! Ah I am so jealous! I have never been to Hawaii but would love to visit. I am with your daughter though, shaved ice is a must have! Hawaii is in my bucket list! Hope to be there next year! I super love this post. 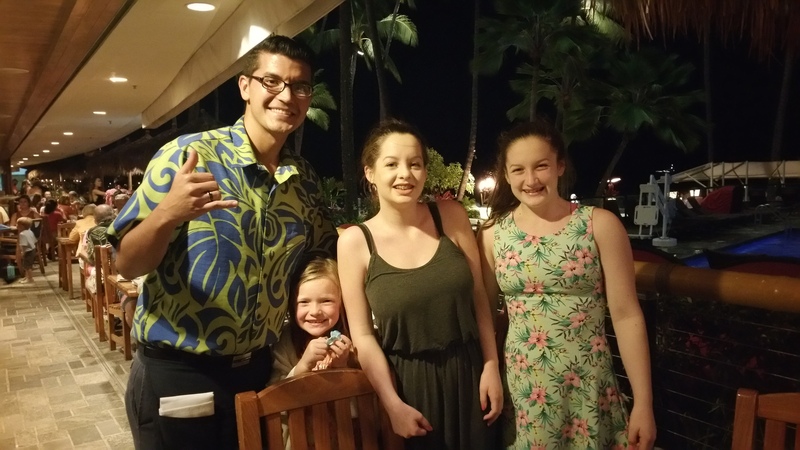 It makes me want to go to Hawaii with my family as well. Can’t wait for Day 2. I can’t wait to go to Hawaii one day. Everything is so beautiful. 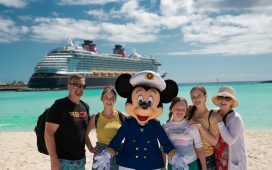 It looks like you had an amazing trip because everyone looks so happy! Hawaii is one of those favorite places in my bucket list which I would want to visit with my husband & kids sometime so soon. The pictures are beautiful enough to express the beauty of nature all around Hawaii & the excitement in everyone of you clearly says you had a great time out there. Oh wow! I would love to visit Hawaii one day. I am loving reading all about your trip. Sounds like day one was amazing! This looks amazing. I’m so jealous right now. I want the sun and beach. I so need a holiday! Work has been so hectic. I went to Hawaii when I was 15 on a band trip. It was so beautiful. I’d love to go again as an adult. That looks like so much fun! You had a beautiful view! I would love to visit Hawaii some day. What a spectacular view! Hawaii is definitely on my bucket list. 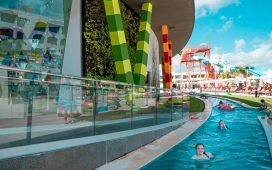 The resort looks amazing! I can’t wait to go! Wow! What an amazing trip! I would love to visit some day! You guys sound like you had an excellent time. Got to spend time with the family and have the anniversary you guys wanted. It is really gorgeous out there in Hawaii! We just visited Oahu this August, but our journey started in the U.K. it took us a whopping 19 hours to get there, but it was well worth it! 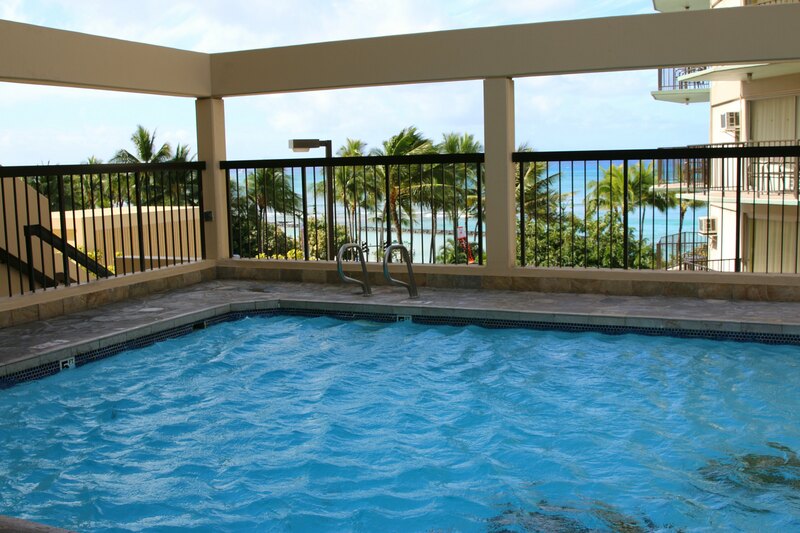 Our favourite memory was probably our day at the Kualoa Ranch, but seeing Waikiki Beach for the first time comes a close second. It’s so cool that you got to see the parade! Whoa! 19 hours… that is a lot of travel time! So glad to hear you liked it. We loved Kualoa Ranch too. The view from up in the hills is a memory I won’t soon forget! Beautiful family! This looks like fun and a lot of excitement. This is inspiration for me to take my family on multiple vacations. 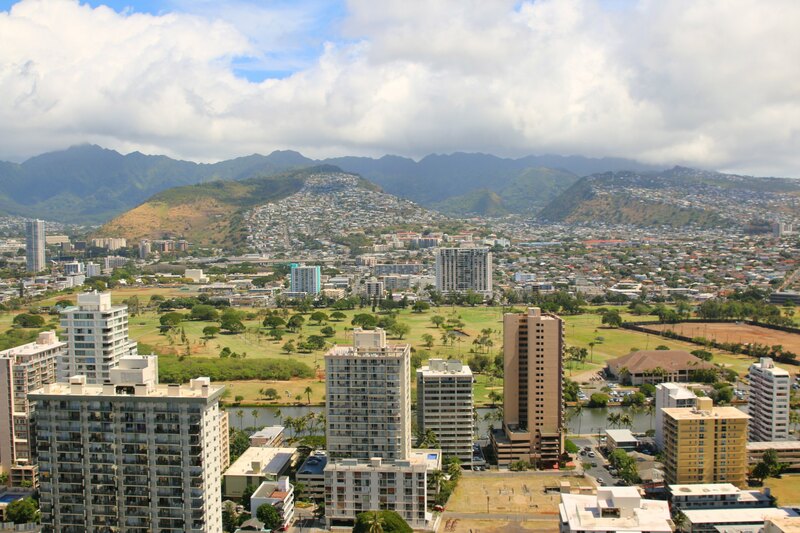 Why did you photoshop Diamond Head in the first “view” from your hotel? It’s quite apparent especially if one has been there before. Diamond Head is not behind the hotels in the foreground of your photo. Plus the cloudy sky doesn’t mesh with the clear sky. No, that is not photoshopped. 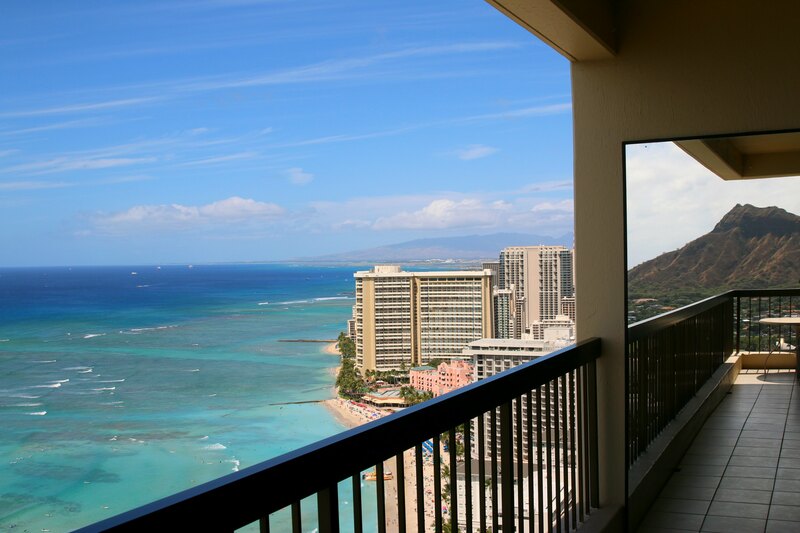 That is a mirror at the end of the balcony and it is pointing towards Diamond Head. 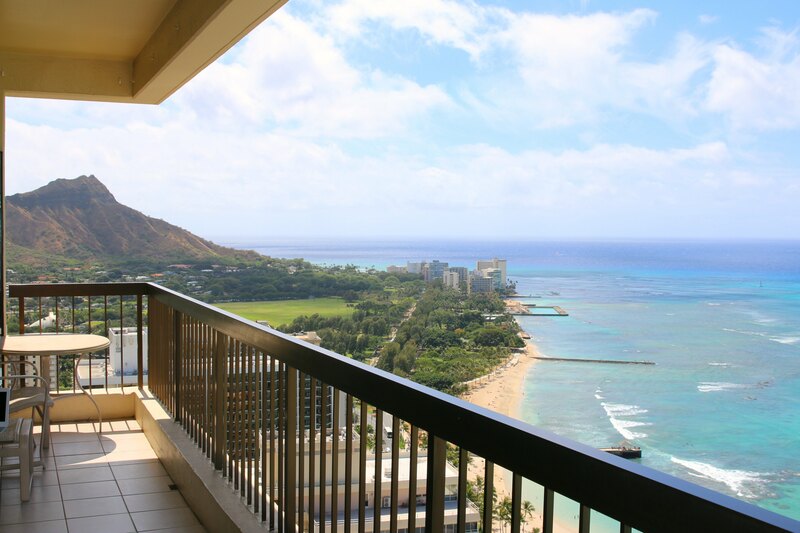 You can see in the pictures below that the other view from the balcony was towards Diamond Head.